We can confirm—although not entirely officially—that New York’s Institute for Urban Design will represent the United States at the 2012 Venice architecture biennale. The Chair of Institutes Board of Directors Michael Sorkin has told AN that the theme of their exhibition will be loosely based on the Institute’s new open-source program, By the City/For The City: An Atlas of Possibility for the Future New York, that played out recently across New York to enthusiastic crowds. The details of the exhibition are still to be developed by Sorkin, co-board member Cathy Lang Ho and the institute’s director (and former AN Managing Editor) Anne Guiney. 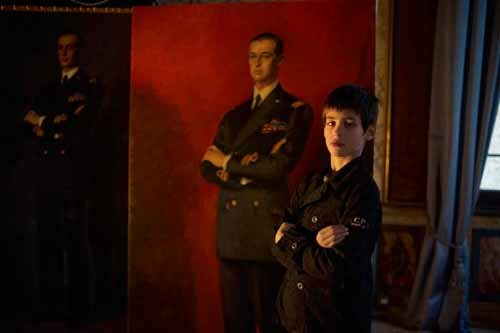 The U.S. Department of State, in a first for the government agency, selected the winning exhibition a full year before the opening of the international exhibition giving the IfUD team time to raise the $300,000 (the State Department has given them $100,000) needed to open in Venice next year. It is not yet clear who will be the official commissioner aka "meeter, greeter, & spokesperson" of the pavilion, but they are currently looking to create “crowd sourced” events all over la Serenissima and not just inside the official giardini or McKim Mead & White American temple. We send our hearty congratulations and will start hoarding our airline miles! The Venice architecture biennale is still over a year away but the longer running art biennale will open next week. If you are of the architecture bent there is always a great deal to see and visit at the art biennale. Here is a sampling including images from Real Venice: International Artists help to Save Venice in the abbey of San Giorgio Maggiore to remind you just how special is la Serrininisma. But perhaps the most exciting exhibit at this years biennale is Venice in Venice organized and curated by the irrepressible Jacqueline Miro and Tim Nye (with help from Tibby Rothman) about our Venice! 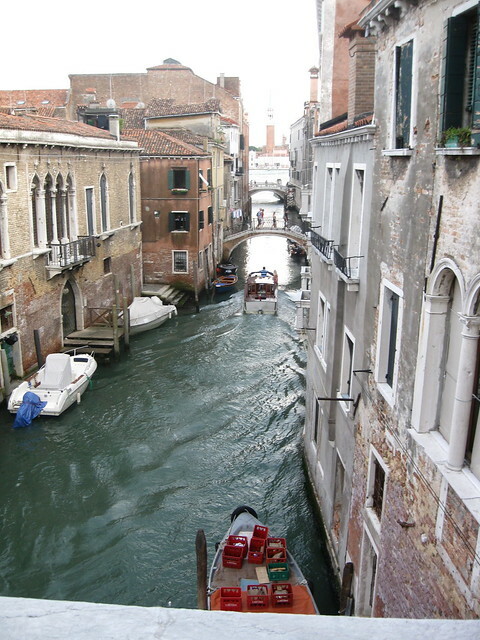 If you are not making it to the Venice Biennale, here are some images to savor! With architectural discourse today so focused on the impact of digital design, it is hard to remember that 20 years ago all architects talked about was postmodernism. The discussion began with the publication of Robert Venturi’s Complexity and Contradiction in Architecture and Aldo Rossi’s The Architecture of the City but became more focused and intense with the opening of an exhibition devoted to the theme. That exhibit, The Presence of the Past, was at the 1980 Venice Biennale and featured a stunning display in the newly renovated “Corderie” of the Venetian Arsenale. That display, Strada Novissima, was a temporary plywood and plaster street, fabricated in Rome’s Cinecitta film studio and featuring facades and back room exhibits by architects including Frank O. Gehry, Rem Koolhaas, Arata Isozaki, Robert Venturi, and an grand entrance by Aldo Rossi. 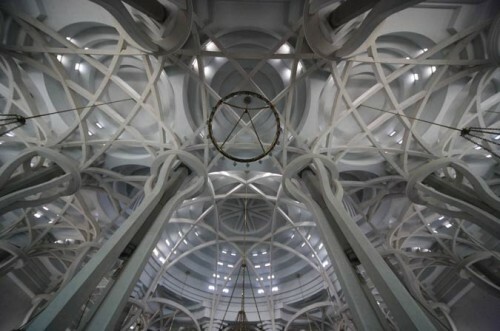 This truly epic show was organized and curated by Paolo Portoghesi, who also curated the 1982 Biennale, which he devoted to the architecture of Islamic countries. Portoghesi will be making his first trip to the United Sates in decades and will be in conversation with myself and Aaron Levy at the University of Pennsylvania School of Architecture on Wednesday, April 20th at Meyerson Hall from 6:00 to 8:00. It may not be time dust off your dog-eared copies of Venturi and Rossi, but it is a rare event to have a figure like Portoghesi lecturing on this side of the Atlantic. This event is free and open to the public. To register, click here. 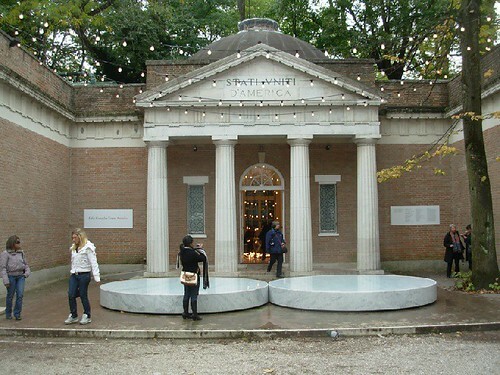 This is the last Venice Architecture Biennale post for 2010--I promise! The organization that oversees all the Venetian biennales (art, film, music etc. ), la Biennale di Venezia, sent us a press release with the numbers from the just concluded architecture exhibition. It claims that 170,000 people visited the event, a 31% increase over the last architecture exhibit in 2008 (which had 129,323 attendees). It should be pointed out however that the older and more established art biennale had 375,702 attendees in 2009. The exhibition included the participation of 53 Countries and 20 Collateral events sponsored by international institutions and organizations and located in various venues in and around Venice. Further, the initiative to bring in architecture students to the biennale produced workshops with 21 Italian universities and 15 foreign schools of architecture, and 49% of the total visitors were students. 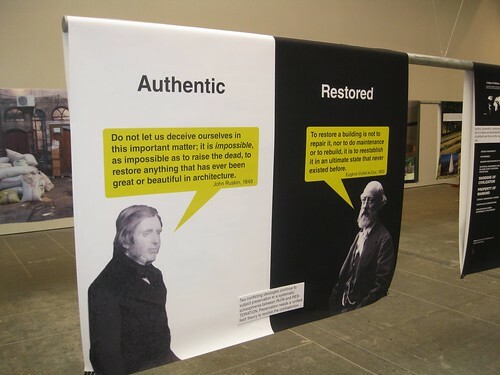 There is no word what was actually produced in these student workshops but the biennale’s Architecture Saturdays, which brought back all the living past curators for conversations, was deemed a success as was the organizations new iphone and ipad apps that link one into the exhibition. The biennale’s president Paolo Baratta, serving his last term as leader of the Italian organization and presumably the person who pushed for Kazuyo Sejima to lead the 2010 event, said in a statement, “We wanted the Exhibition to come back to talk about architecture as indispensable art for planning the civic public life and for growing a civilization that addresses people towards their relations with the others. Sejima offered us an exhibition that enriches our sensibility for the space in which we live, of us as architects but especially as private and public commitments, that have the role to give shape to more qualified questions and ambitions. An exhibition addressed to thinkers and students, but also to the big public as ever that came to visit it.” The 2010 biennale was like its President Baratta: smart and elegant. Fino. The so-called Croatian floating pavilion designed for this year’s Venice Biennale by the group of architects and professors—Sasa Begovic, Marko Dabrovic, Igor Franic, Tanja Grozdanic, Petar Miskovic, Leo Modrcin, Silvije Novak, Veljko Oluic, Helena Paver Njiric, Lea Pelivan, Toma Plejic, Goran Rako, Sasa Randic, Idis Turato, Pero Vukovic, Tonci Zarnic—who used a huge amount of Croatian taxpayers’ money to build it, was never exhibited there because it has collapsed infamously, like a melted custard pastry, on its way. In spite of the fact that irreparable damage was caused by the structural failure, nobody took responsibility for the biggest fiasco in the history of Croatian architecture. I was at the Venetian Giardini with several other journalists on the day the pavilion was meant to arrive, and we watched as the pavilion appeared in the hazy lagoon but never quite made it to the dockside, so in the spirit of Venice we settled in at the Giardini bar and enjoyed a spritz. 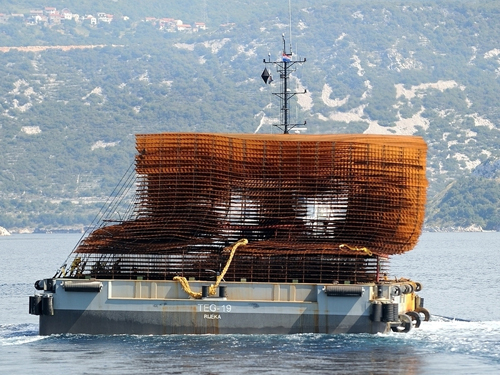 In an email, one of the designers, Leo Modrcin, explained that “the Croatian pavilion was damaged during the transportation from Croatia to Venice. It required additional bracing for longer trips and exposure to the sea’s elements. The recommended removable scaffolding frame was not installed due to time and funding constraints. The lashing of the structure was executed by the towing company, but was obviously inadequate.” Obviously! But pavilions are by nature temporary and ephemeral, and this one at least looked great! We all know how important media images are to architecture, and it still remains one of my favorite pavilions in Venice. The Venice Architecture Biennale has traditionally opened later in September. But this year, because of a scheduling conflict, it is opening on August 29 and will remain open until November 21. We will be blogging from the biennale during the press preview and beyond, so watch for our posts of events, press conferences, and parties. If you want a list of official biennale events you can of course check their website, along with the new iPhone app that launched today. But this year there seem to be more collateral events to the official program than ever before. Here is an unofficial listing of some of the most exciting: August 22-27 The NOW INTERVIEWS: Hans Ulrich Obrist The curator of the 12th architecture biennale, Kazuyo Sejima, commissioned Hans Ulrich Obrist to create a new iteration of his ongoing Interview Project, first conceived in the 1970s and now produced for the biennale by the Institute of the 21st Century. Obrist will conduct the interviews in the Arsenale and talks with Sejima and Ryue Nishizawa (August 24, 9:30 a.m.), Frank Gehry (August 27, 10:30 a.m.) and this year’s Golden Lion winner Rem Koolhaas (August 25, 9:30 a.m.). Meanwhile, Bice Curiger, curator of the 2011 art biennale, will turn the tables and interview Hans Ulrich Obrist (August 26, 5:00 p.m.). August 25 Pier Luigi Nervi: Architettura come Sfida This exhibition of the engineer and architect opens on August 25 at Palazzo Giustinian Lolin Campo Manin, San Marco, and runs through November. The Arts of Giambattista Piranesi: Architect, Etcher, Antiquarian, Vedutista, Designer on Venice This exhibition, on the island of San Giorgio Maggiore, opens on August 25 and runs through November 21. August 26 Rethinking Education: A New Postgraduate School in Moscow, and OMA Strelka, a new postgraduate school in Moscow for Media, Architecture, and Design, is teaming up with OMA for a conversation on architectural education in Russia and beyond. OMA’s think tank, AMO, has developed an educational programme for Strelka, which will open its doors to students in October. 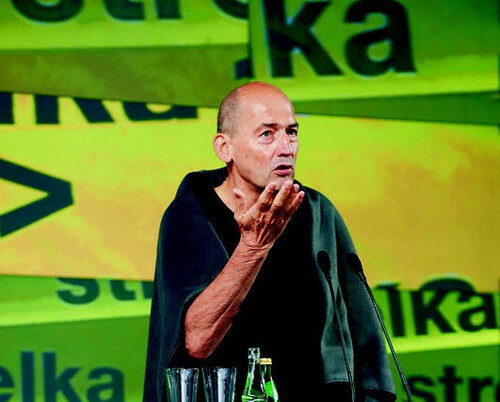 Rem Koolhaas introduces Strelka’s educational team and presents the school’s research agenda. On Thursday, August 26 from 2:30 to 3:45 p.m. at the Teatro Piccolo Arsenale, Venice. Mapping Contemporary Venice from the City of Today to the Venice of the Future Venturing into a project far from the mass tourism postcard, this exhibition is set down in the moleskines with the visionary idea of Acqualta in 2060. It will take place at the Venice International University on San Servolo Island from August 26 to September 20. Inventario Stop by the launch of a new publishing project called Inventario—part book, part magazine—on August 26 at Ca’ Giustinian (headquarters of Biennale) at 6:00 p.m. August 27 Workshopping The United States pavilion presents projects that “involve the architect as the initiator of a transdisciplinary cooperative team focused on research, social engagement, and private initiative for public benefit.” Featured practices include Hood Design, MOS, John Portman & Associates, Guy Nordenson, Catherine Seavitt, ARO, the LSU Coastal Sustainability Studio, Anthony Fontenot, Chicago’s Archeworks, Michael Sorkin’s Terreform, and UCLA’s cityLAB. The opening press conference is Friday, August 27. Architects Meet in Fuori Biennale This is the first survey on worldwide architects under 35 by the Association of Italian Architects and Critics. The event will take place in two different venues on August 27. One is at the Aula Magna of the Università IUAV di Venezia (S. Croce 191 Tolentini), where the work of young Italian architects and critics will be presented. Architecture on Display Book Party The launch party for Architecture on Display: On the History of the Venice Biennale of Architecture, will take place at the Fondazione Giorgip Cini on the Island of San Giorgio Maggiore from 11:00-1:00 on August 27. The book features Aaron Levy and William Menking in conversations with Vittorio Gregotti, Paolo Portoghesi, Francesco Dal Co, Hans Hollein, Massimiliano Fuksas, Deyan Sudjic, Kurt Forster, Richard Burdett, Aaron Betsky, Kazuyo Sejima, and biennale president Paolo Baratta. Beyond Entropy: When Energy Becomes Form Following the book launch, the Architectural Association will host a symposium on eight projects dealing with science and architecture. Speakers include Hans Ulrich Obrist, Beppe Caccia (Councilor, Venice City Hall), Joseph Rykwert, Stefano Boeri, Eyal Weizman, Suman Basar, Richard Burdett, and Hans Hollein. If Buildings Could Talk The press conference for a new film by Wim Wenders, described as “a visual 3-D video installation that investigates the Rolex Learning Center in Lausanne, the recently inaugurated building by SANAA,” will be held on August 27. Wenders explores the question of how buildings communicate with their users, responding to Sejima’s theme for the biennale, “People Meet in Architecture.” The film will screen for the duration of the biennale. Longing for... Score #1 A hybrid performance-installation focusing on translatory movements of choreography and architecture, this show focuses on choreography as a description and design of space, through which representational conventions of both disciplines are brought into dialogue. Runs from August 27 to August 29 at the Arsenale Novissimo. August 28 M9: A New Museum for a New City The studios Agence Pierre-Louis Faloci, Carmassi Studio di Architettura, David Chipperfield Architects, Mansilla+Tuñón Arquitectos, Sauerbruch Hutton, and Souto Moura Arquitectos will present designs for the new museum and renovation of the former Matter barracks, which on this occasion will be open to the public for the first time. It runs from August 28 to November 21 at Via Alessandro Poerio, 24, Venezia-Mestre. The Bearable Lightness of Being: The Metaphor of the Space 2 This show’s 22 artists developed a special artistic engagement in interpreting the functional nature of space and its anthropological or political references. Taking space, taking ground, and working in the cultural field are the centre of this exhibition. At the Arsenale Novissimo, Tesa di San Cristoforo 94 from August 28 to October 7. L’Aquila Exhibition and Talk SISMYCITY is photographic project on the aftermath of the earthquake that struck the Italian city of L’Aquila on April 6, 2009. This exhibition and conference, held in the Palazzo Ducale, aims to make Venice itself a city-wide gallery for documentary images of the post-earthquake situation and the collective thinking on the future of the city. Join Angelo Scola, Massimo Cacciari, Robert Hammond, and others for the conference on Saturday, August 28 at 9:30 a.m. August 29 The Garden and Beyond: A Global Garden The garden has for centuries been a source of inspiration and fascination, and the object of cultural, scientific, and aesthetic studies. Its configuration as a closed space makes it similar to the more properly sacred, prohibited, or secret spaces and it shares the same definition of humanity and civilization in the finest possible sense of this term. The exhibition will be on view from August 29 to November 21 at ESU Venezia, sala polivalente “Nardocci,” Dorsoduro, 3861 (Calle larga Foscari); VELA-Actv info point “Hellovenezia,” Isola Nova. Austria Under Construction: Austrian Architecture Around the World The Austrian pavilion, curated by the American architect Eric Owen Moss, includes a long roster of international architects building and teaching in Austria such as Raimund Abraham, Coop Himmelb(l)au, Hans Hollein, Rainer Pirker, Behnisch Architekten, Zaha Hadid Architects, Steven Holl, Michael Sorkin Studio, and Lebbeus Woods. Project Eco-Delta: Design for Coastal Cities The Van Alen Institute and Environmental Defense Fund host a roundtable discussion to explore the environmental challenges faced by coastal cities throughout the world. Titled Project Eco-Delta, the initiative is part of VAI and EDF’s ongoing collaboration in developing design strategies for the landscape surrounding New Orleans. The forum will feature leading experts such as Stephane Asselin (AECOM), Maria Teresa Brotto (Consorzio Venezia Nuova), Stephen Cassell (ARO), and Padraic Kelly (Buro Happold). Check it out on Sunday, August 29 at the U.S. pavilion. Chance Encounter Venice The multidisciplinary art project TEVERETERNO, which has advocated for the revival of Rome's Tiber River, is sponsoring Chance Encounter as part of the opening of the Italian Pavilion on August 29 at 3:30 p.m. The Biennale Architettura 2010 in Venice will open a month earlier than usual this year, with the media vernissage set for August 26–28. The Architect’s Newspaper will be there blogging daily on Kazuyo Sejima’s curated exhibition People Meet in Architecture, bringing you reports from all the national pavilions, collateral exhibits, and of course the parties. Invitations to events have been coming in to our office every day this month, and on August 20 we’ll publish a complete itinerary for those of you attending the biennale. This year, the United States pavilion is being organized by Atlanta’s High Museum and the publication 306090, under the direction of curators Michael Rooks of the High Museum and 306090’s Jonathan D. Solomon. The pavilion theme is Workshopping, and it presents projects that “involve the architect as the initiator of a transdisciplinary cooperative team focused on research, social engagement, and private initiative for public benefit.” Featured practices include Hood Design, MOS, John Portman & Associates, Guy Nordenson, Catherine Seavitt, ARO, the LSU Coastal Sustainability Studio, Anthony Fontenot, Chicago’s Archeworks, Michael Sorkin’s Terreform, and UCLA’s cityLAB. If you want to know more about the exhibition, check out its new website! The U.S. Department of State has announced that Workshopping: An American Model of Architectural Practice will represent the United States at the 2010 Venice Architecture biennale, opening on August 29. The State Department selected the exhibit, organized by the High Museum of Art in Atlanta and co-curated by the museum’s principal curator Michael Rooks with Jonathan D. Solomon, founding editor of the series 306090 Books, in an open competition following the recommendation of the Federal Advisory Committee on International Exhibitions, convened by the National Endowment for the Arts. Exploring the evolving role of designers in relationship to other disciplines, the exhibition will focus not on projects by individual architectural practices, but on collaborative projects like On the Water: Palisade Bay by Guy Nordenson, Adam Yarinsky, and Catherine Seavitt; the urban design plan New York City (Steady) State by New York–based Michael Sorkin Studio; and The Rosa Parks Project by the Los Angeles–based think tank cityLAB. 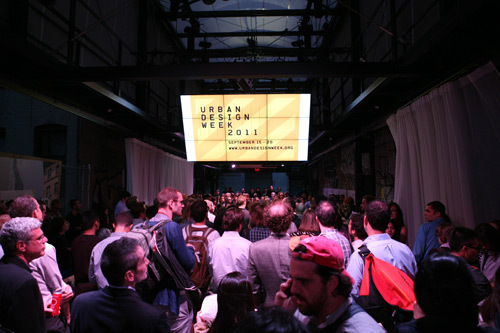 These projects, according to the curators, represent “an evolving constellation of specifically American conditions—the hierarchical model of architectural practice, the mostly regulatory function of government, and the critical role of private corporations and non-profit foundations in driving public projects”—creating a unique new model of design practice. The Biennale, overseen by SANAA's Kazuyo Sejima, runs through November 21. 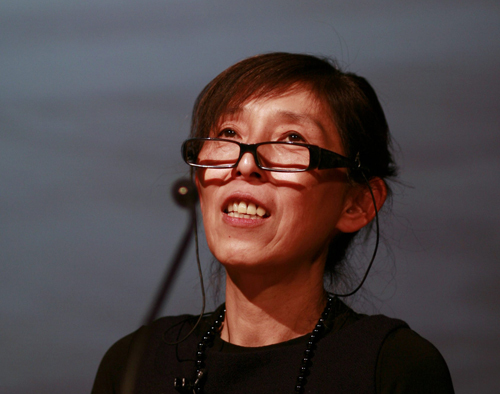 The president of the Venice Biennale, Paola Barrata, announced this morning that the director of the 12th International Architecture Exhibition will be Japanese architect Kazuyo Sejima of SANAA Architects. Last week, we reported rumors that the next director was going to be a woman—a first for this most important of international contemporary architecture expositions. The names most frequently bandied about for this major job were Sejima and Liz Diller. In a formal statement, Sejima said, "The biennale has to be everything and all encompassing, a steady conversation with people who are doing things and the viewer or public who see what they are doing." 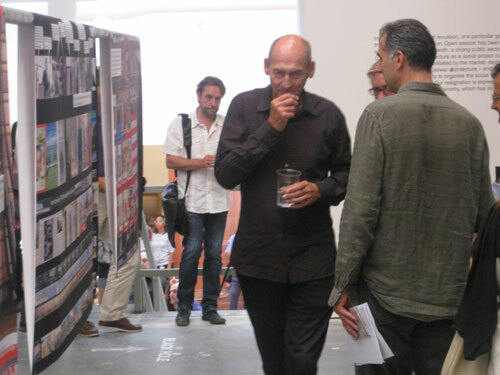 The 2008 Architecture Biennale was directed by Aaron Betsky whose selection was announced only in January of that year. In picking Sejima, the Biennale has chosen a practicing architect for the first time since Massimiliano Fuksas in 2000. The Biennale has also announced that the exhibition will open on August 29 (with previews starting on August 26) and run through November 21. Traditionally, the Biennale opening date has been mid September; an earlier date should allow many more people to attend the event. It is two days before the opening of the Venice architecture Biennale and as commissioner of the United States pavilion I have been in Venice for a week mounting the exhibition. The Biennale opens on Wednesday for “important media” and the next three days for the rest of the press and anyone else that can find a ticket. This always sets up a huge scrum at the entrance to the grounds between the haves (those with passes) and the have-nots in the media. 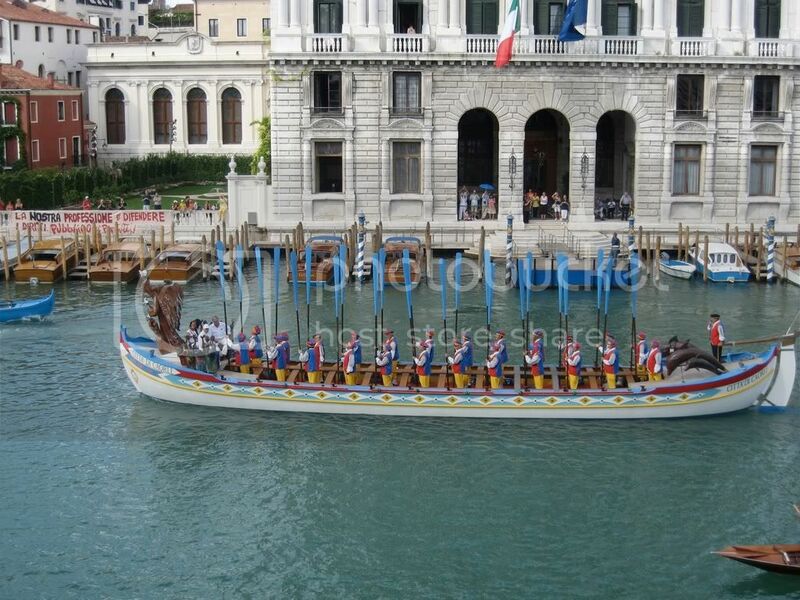 But yesterday I was invited to the roof of the Peggy Guggenheim Collection to watch the Venice regatta . The regatta is supposed to be a race of gondolas but is really a great Sunday afternoon passeggiata of colorful boats paddling down the Grand Canal. Back at the U.S. pavilion we are still not quite finished and I decide to walk around the biennale ‘giardini’ grounds to test the stress levels of other curators. Directly on axis with the U.S. pavilion somebody has constructed a nearly a 40 foot high solid steel building out of scaffolding floor slats. It’s just next to the Spanish pavilion but no one seems to be around to explain the amazing structure? In the “Old Europe” corner of the giardini the Swiss pavilion will include a brick laying robot named R/O/B but he/she is still in a shipping container. The British curator Elias Woodman shows me through his pavilion which features housing designed by architects that Peter Cooks at dinner last night labeled "the Whisperers.” But Elias has created a fantastic catalog on the history of British Housing--compared with similar events in Europe. In the front of the Brit’s pavilion an enormous yellow steel pipe shoots out of the Russian pavilion and makes it way towards the west. It is apparently the creation of the Estonians who mean it to suggest the connection of oil or natural gas from Russia to the rest of Europe. The Japanese have created a beautiful glass greenhouse in front of their pavilion but it must have cost as much to fabricate and build as the entire U.S. pavilion’s budget? Next to the ours is the most beautiful pavilion in the giardini--the Scandinavian, created by Pritzker winner Sverre Fehn. Then lunch at Trattoria dai Tosi where a really good 4 course working mans lunch is 15 Euros--well that’s 12 Euros for Venetians and 15 for everyone else. You can try sitting in the far back of the hot Venetian dining rooms to get the better price but then 3 euros is a small price to pay for this perfect little spot. Back to the Italian pavilion, curated by Aaron Betsky and EmilianoGondolfi, which is still nearly empty as I walk over the meet ‘Stalker’ Lorezo Romito.Lorenzo is creating an I Ching room to determine the future of architecture. I am supposed to be throwing the I Ching“to determine the future of American architecture.” But Lorenzo is nowhere to be seen, his room empty. Walking through this enormous pavilion I run into Gondolfi who shows me around the few displays that are in construction. I did come across L.A. architects Benjamin Ball and Gaston Nogues, alums of last year's P.S. 1 summer pavilion, up on a scaffold carefully weaving draped string into an inverted baroque dome. The crew in the U.S. pavilion must be missing me, so I head back to the building in the center of the giardini. Back to work on Monday and then maybe a trip to the Arsenale.